After taking down Medusa, Batwoman expected her life to get easier. Not so much when caught in the crossfire between Batman and the D.E.O., Department of Extranormal Operations. The organization has their sights set on the Dark Knight, and could be using Batwoman to capture him. But is Batman the true threat? Writers J.H. 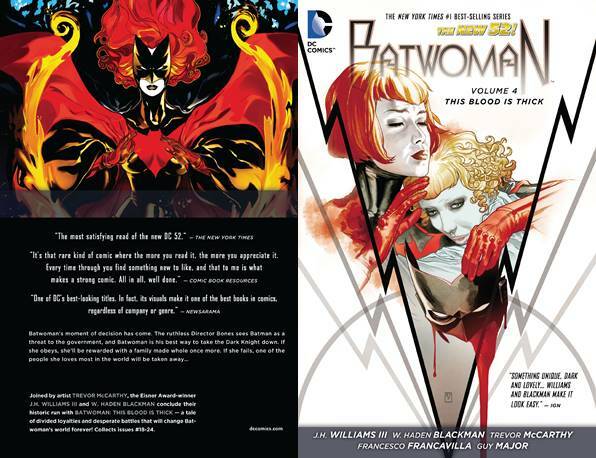 Williams III and W. Haden Blackman and artist Trevor McCarthy continue their mammoth run on the critically acclaimed title in BATWOMAN VOL. 4: THIS BLOOD IS THICK.